Walk with me. Today we're going to Sunnyslope, Arizona, which is a neighborhood a few miles north of downtown Phoenix, along the southern slopes of the Phoenix Mountains. It's the 1950s. As a child of the 1970s myself, I know all about the fifties. At least I think I do. Everything was clean, everything was perfect, things only cost a nickel. Everyone had a brand new house, and great big brand new cars. And it's mostly true. The 1950s were a time of tremendous prosperity for the United States. My dad, by the way, was a classic example of that prosperity. He fought in World War II, came back home to the GI Bill, got a business degree, and raised a family. When I think of the 1950s I think of my parents, but that's not what everyone did. Now calm down here, I'm not saying that "everything you knew is wrong" - I'm just saying that there's more to the story. 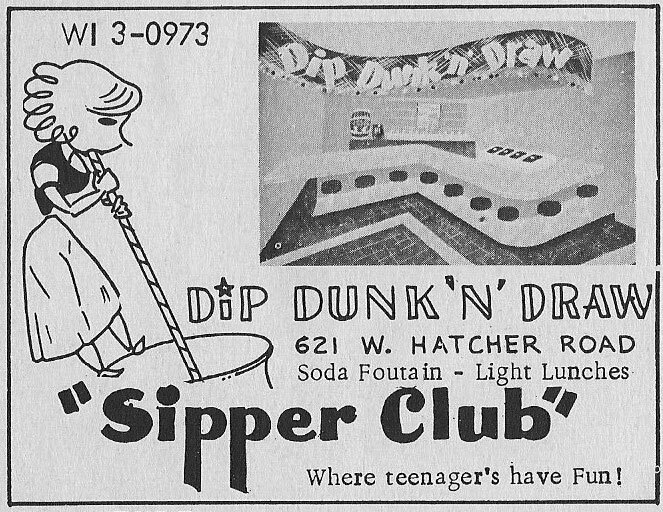 Let's walk down Hatcher and go to the Dunk 'N' Draw. We're teenagers in Sunnyslope, Arizona. Yes, of course you're wearing a Poodle Skirt and I have my hair slicked back in a ducktail. Excuse me for a minute, I need to run a comb through my hair, so I'm looking at my refection in a store window. But that's not all I'm looking for. I'm a Juvenile Delinquent. I'm watching out for my Truant Officer, and also the Sheriff. No, of course I'm not saying that all of the teenagers in Sunnyslope in the 1950s were like that, but it's something to keep in mind when we think about how everything used to be "nice". It depends on what you define as nice. Please allow me to explain. No, I've never lived in Sunnyslope, but I've lived in similar neighborhoods, in California, and in Tempe. And these weren't the kind of "nice" neighborhoods that usually spring to mind, with manicured lawns, and gates, and brand new cars. These were places where people who didn't have a lot of money felt at home, and were welcome. These were neighborhood, or "hoods". The people who lived there were at home, and were called Home Boys and Home Girls. And yes, there were criminals, and thieves, and people who drank a lot of alcohol, and took drugs. That sort of thing goes along with that type of neighborhood. So today I'm thinking about the history of Sunnsylope. It began as just a place out in the desert where people who had tuberculosis could go, and maybe live in tents. It was the kind of place that John Steinbeck describes in Cannery Row, a place of of saints and sinners, and they're both the same. Yikes! It's the Sheriff! Let's go into the Dip 'N' Draw and I'll buy you a malted! Can you lend me a nickel?